The Black Sea in the Light of New Archaeological Data and Theoretical Approaches contains 19 papers on the archaeology and ancient history of the Black Sea region, covering a vast period of time, from the Early Iron Age until the Late Roman - Early Byzantine Periods. The majority of papers present archaeological material that has come to light during the last few years, in excavations that have been taking place in several parts of Pontus. Additionally, there are papers that present theoretical approaches to historical issues concerning the Black Sea, its local peoples, cultural aspects or specific sites, while at the end there is as well as a section on the connections between the Black Sea and northern Greece. 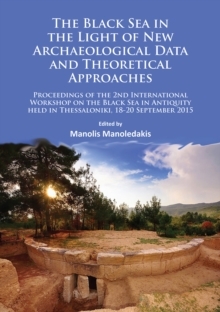 Thus, the reader of this volume will have the opportunity to be informed about new archaeological results from excavators of some very important Black Sea sites, focus on specific categories of excavation finds or constructions, but also encounter new theories and ideas about social aspects of life in the Black Sea in ancient times. All these indicate once again the impressive acceleration of the archaeological and historical research that is being conducted in the last few decades in the Black Sea littoral, which continues to attract the unfailing interest of scholars from around the world.